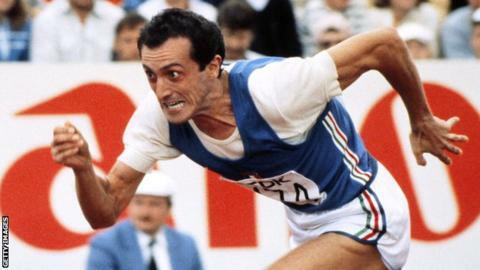 Italy's former 200m world record holder and Olympic champion Pietro Mennea has died, aged 60. The sprinter won 200m gold at the 1980 Moscow Olympics, beating Britain's 100m champion Alan Wells into second place. Mennea also won bronze in the 4x400 relay at the same Olympics, to add to a 200m bronze from the 1972 Munich Games. "British fans will recall Mennea's great duels at 200m with Alan Wells, often decided by a few hundredths of a second. "Their most memorable duel came at the 1980 Moscow Olympics. Wells raced into a substantial lead and looked set to claim the Olympic sprint double. Then Mennea, one lane outside, clawed ahead with his closing strides to win, and forced his way through the Soviet security throng to complete a lap of honour." He broke the 200m world record in 1979 with a time of 19.72 seconds, a record that stood for 17 years until Michael Johnson ran 19.66 in 1996. American Johnson's record was bettered by Jamaica's Usain Bolt at the 2008 Beijing Olympics and now stands at 19.19 - but Mennea's time remains the European record. Later a Member of the European Parliament following his retirement from athletics, Mennea also collected three European Championship golds at 100m and 200m during his career. Italian National Olympic Committee president Giovanni Malago said Mennea's body would lie in state at Olympic committee headquarters. No cause of death has been announced.